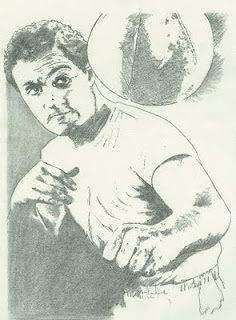 “Everyone is giving things to the library!” Artist and Rocky Marciano admirer Joe Gemellaro drove a couple of hours from his home to Brockton with his original sketch and the first in a series of prints of it, of Rocky, the Brockton Bomber. I thought we were going to discuss the possibility of his donating it to the library. Instead he signed the Certificate of Authenticity and gave it to me on the spot. I promised to have it matted and framed professionally, and to invite him down for a photo shoot and press release when we officially unveil it. All of this before lunch. How interesting it is to be the face of the public library!